Thank you for visiting this website and considering services from Jersey Strong Paving contractor. We provide asphalt/blacktop paving services for both commercial and residential needs. We offer paving services that will repair, resurface, renew, or create any driveway, parking lot, roads, tennis court, basketball courts or play areas. Surfaces that potential clients desire to pave but are unsure if it can be done- contact us. We are creative problem solvers and if possible, we'll figure it out. No Worries about our abilities or knowledge: Jersey Strong Paving was founded 18 years ago by a 4th generation NJ asphalt paver. The years of hard work on his family's company's job sites provided a deep understanding of the steps necessary to build attractive and strong driveways, roads, and robust spacious parking lots. All Jersey Strong Paving employees receive industry and safety training with reviews conducted periodically. This not only keeps our employees safe but up-to-date on industry standards. We also offer paths to advancement, pay a living wage and provide valuable benefits. We understand that only desirable working conditions will retain valued employees. We are licensed, bonded and insured (including Liability and workers compensation). We are concerned contractors that take the extra steps necessary to make sure our clients are protected from license and liability concerns. Asphalt Pavement, a deep black, resilient, water-repelling substance (liquid when hot and solid when cooled) covers around 94 percent of the paved roads in the USA. Driveways, parking lots, racetracks, airport runways, tennis courts and basketball courts paved by asphalt are smooth, solid, sound deadening driving surfaces promoting movement of people and goods safely and quickly. Choosing an asphalt contractor is difficult and even risky. Protect yourself by contacting at least three rock-solid asphalt contractors to compare cost estimates for paving services. Asphalt contractors are rock-solid and worthy of a closer look if they carry the following traits: They have spent years providing reputable services in your shared community; will openly share customer reviews and Better Business Bureau ratings; are licensed, bonded, insured and offer free project consultations with firm estimates. First impressions of a customer or client as they cautiously traverse a muddy gravel-based parking lot is hard to counter- even when a pleasant interior for shopping or service awaits. Seniors will definitely pass by such a business rather than take the substantial risk to weave through a broken and crumbling parking lot. Many clients will pass by a business without dedicated parking instead of finding close parking along the street. Many clients just don’t want the trouble of searching for a parking spot or they don’t like to parallel park. Take advantage of our complimentary, no hidden commitments, inspection and let Jersey Strong Paving show you how affordable it can be to improve the value, appeal and safety of the gateway to your business "the parking lot". For further information about a parking lot install in Trenton, click here! Commercial paving of apartments, medical parks, office parks, industrial parks, schools, universities, and HOA communities all need, at some point, parking lot repair, resurfacing or restoration. Working with an experienced asphalt paver is the best action you can take to help the project move forward on schedule and budget. Inexperienced pavers quite often make errors in underestimating the materials needed or not having enough employees for the project. All of these errors in judgment will bring havoc to the jobsite- nothing will be on schedule and cost overruns will be common. The major preventable reason asphalt pavements prematurely fail is because of inadequate grading that allows water infiltration under the pavement surface. The land surrounding the asphalt pavement must be graded to flow water away from the pavement so it can’t erode the stable base. Other reasons include insufficient gravel materials laid down, careless compaction of the asphalt pavement layers, a base asphalt mix, laying asphalt mix that is too cold and laying asphalt in rain. These considerations are paramount during our design process and then correctly implemented to provide our clients with robust worry-free parking lots or roads. Note: a base asphalt mix is typically made with larger stones and less amounts of asphalt cement (tar) and sand which produces a rough surface. A good surface asphalt is made with smaller stones and more asphalt cement and sand which produces a smooth surface. Resurfacing or overlaying a parking lot is less costly than fully reconstructing a paved surface, and typically takes less time. This is a great option for large parking lots that have a lot of surface wear and need asphalt repairs. However, the areas that now puddle will again puddle since in most cases, the grade cannot be altered by just paving an overlay. Life expectancy for an overlay or resurfaced parking lot is 8-10 years if properly maintained. To learn more about resurfacing a parking lot, click here! If you want to find out if asphalt resurfacing is right for your project, please contact us and we'll be happy to give you an estimate and let you know what would work best for your paving needs. We offer application of all types of sealcoating to protect and waterproof asphalt pavement from the ravages of UV rays, oil spills, gas spills and rain water- these are common oxidizers that slowly destroy the asphalt binder (the black glue that holds the crushed rock together). As the asphalt pavement becomes light grey, it loses flexibility and becomes brittle enough to start breaking up as vehicles are driven on it. Sealcoating periodically, will maintain flexibility in the pavement and stop pavement breakups for almost double the original expected lifespan of the parking lot. After the free inspection, we will recommend a specific product that will suit the unique needs of your parking lot. Then, for clients, our professional application of the chosen sealer will seal your parking lot- producing a non-porous surface where dirt and debris easily washes off. Most commercial asphalt paving companies suggest sealcoating every 2 to 3 years. That corridor of darkness leading to your garage is a substantial part of the home’s view and does have quite an impact on curb appeal. A broken up, weed infested asphalt driveway states this home has not been maintained, besides the fact, that you or visitors will not have a dry smooth place to park. As soon as your driveway is showing cracks or potholes, contact a professional asphalt paver, like Jersey Strong Paving to inspect and repair it because it will only continue to deteriorate at perhaps a faster rate than before. Need Asphalt Services in Trenton: Click Here! Asphalt pavement repairs require inspection before committing to a specific type of fix. A driveway's pavement is a sum of its parts and each need to be examined to understand the root cause of the failure. For example, the grading of the immediate and surrounding area should direct storm water away from the pavement. Tree roots may be growing under the pavement, or upheaval or perhaps a heavy camper is parked where the driveway is cracking. The causes of pavement breakup are many and variables exist at every home, so onsite inspections are necessary. We always, when possible, suggest repair first, and offer affordable options when replacement is advised. For further information about driveway repairs, click here! -New asphalt driveways can last nearly 30 years when water is directed away from the pavement and when maintained periodically with sealants. Broken-down blacktop can be grounded on site and used as base for new projects or can be recycled at an asphalt recycling plant to be incorporated or recycled into mixtures for new pavements which makes this the most earth friendly material used in construction today. Need to Repair a Driveway in New Brunswick- Click Here! As you drive through residential neighborhoods, take notice of the condition of the driveways. Some are in very rough shape, others look well maintained and yet others look crazed or display many fine cracks. Cracking and bumps occur when homeowners use blacktop sealers from the big box stores without washing down the driveway first. This causes adherence problems as well as debris showing up under the coating. The DIY homeowner may also put the product on too thick which causes the too heavy solution to escape and follow gravity, thereby displaying a drooping rippling surface. Just like when painting a wall in your home you run into drips and waves when using too much paint. Seriously, Jersery Strong Paving uses better sealers specifically chosen for the unique needs of your property's driveway and we're not as expensive as you may think. Prospective clients please take the opportunity, eagerly offered, for a free estimate without conditions- go to our contact page now! 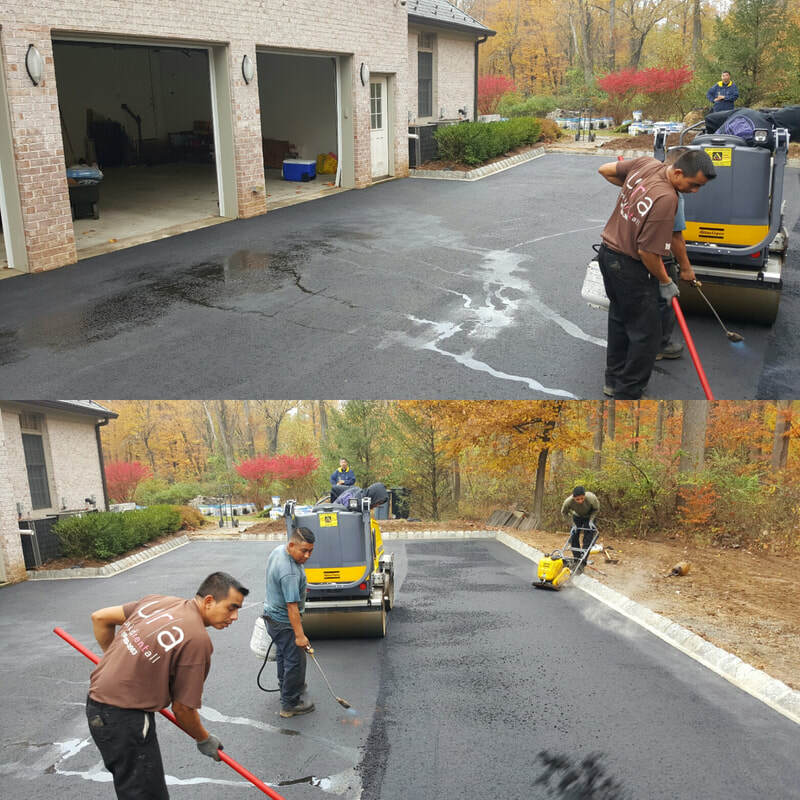 When you ask Jersey Strong Paving to sealcoat your driveway, it will be done with professional sealers designed for your specific location with care and precision. Many times, we tell our children to go outside and play but do little about finding a them safe place to play. Why not, consider putting in a basketball court- it will not only wind down raucous boys but give the girls some needed exhausting play time as well. We are adept at building basketball courts, tennis courts and playgrounds. Jersey Strong Paving pays attention to what’s underneath the pavement as well as making it pretty on top with court line striping and customization with colors and logos- we build courts to last. It can be very comforting to know the kids are playing in a safe area. We can certainly help get you started on a play area project with a free consult for specialty paving services. Need, Specialty Paving Services information, go here! We also offer installation or repair of tar and chip pavement: a less costly yet durable option for residential, commercial and industrial clients. Tar and Chip driveways, parking lots and roads are built on site. Other positives of tar and chip are the many color choices available for crushed rock and its low-maintenance- cracks can repair themselves when tar heats up in hot weather. Looking for Tar and Chip Services in Hunterdon County- Click Here! Homeowners, property owners, managers, developers, medical office maintenance, and any other commercial endeavor, please contact Jersey Strong Paving to request a complimentary on-site consultation and estimate! If you’re not 100% satisfied with our assistance, be sure to let us know! We guarantee our services and will do our best to ensure that you are another satisfied customer!